Hedge trimmers are fantastic tools for making sure that everything in a yard is well taken care of, but unless you like digging out the ladder then you’re going to have some trouble when it comes to truly massive hedges. Thankfully, there’s a sub-class of these garden tools which can eliminate the extra labor associated with maintaining enormous shrubbery. Pole hedge trimmers are exactly what they sound like, a hedge trimmer… on a pole. It’s a simple concept, but you’ll quickly find they’re indispensable for many uses when it comes to maintaining your yard. If you think one of these would be perfect for you, then you’re in luck, we’ll show you how to pick out the best quickly and easily in order to make sure your landscaping maintains its perfection year round… without having to deal with ladders and sore shoulders. We’ve taken the time out to bring you five of the best, take a look over the guide again if you’re still uncertain but one of these is sure to be perfect for your yard, no matter what you’re doing. Giving you the best of both worlds, this trimmer produced by Earthwise has what it takes to make sure that you can get the job done no matter where it’s at. It can also be set at 6 different angles. The motor isn’t the most powerful, coming in at only 2.8 amps but it’s enough to handle most domestic shrubbery with a surprising amount of ease. You can also take it off the pole in order to have a hand-held trimmer if you’re working up close. The only real disadvantage here is that the pole may be a bit short for some people, since it only stretches things by 48”. It’s highly recommended if you want a versatile, corded trimmer. If you’ve got a jungle of a yard, and not a lot of thick shrubbery, the GreenWorks 22272 is exactly what you’re looking for. It comes with a 20” bar which allows you to shorten your task, and the telescoping handle means you can get any job done. There’s more though, the manufacturer has a 4 year warranty on the trimmer and a 2 year warranty on the battery, so you know they have faith in their product. Add in a 5/8” cutting capacity and you’ve got a winner. This one is highly recommended if you’ve got a jungle that needs some management. Coming in with an amazingly powerful 4.8A motor and a ¾” cutting capacity, this trimmer from Garcare is made for tough jobs and it’ll handle them easily. The head also pivots to 90” on each side, so you can flat top your hedges without even thinking about a ladder. All of that, and it comes in at a bargain price. Go with this one if you’re trying to handle tough shrubs with astonishing ease. Tanaka makes some of the best, and you’ll pay for the extra power you gain while using this trimmer. If you’ve got the money to spend, though, the 21cc motor will allow you to make short work of anything but a tree, and you’re backed by a 7 year warranty in case anything goes wrong. The head angles however you might need it, allowing you to handle tricky corners and tops without having to get anything done. Go with the Tanaka if you’re looking for a professional quality trimmer, it’ll handle any task you might throw it at. Looking for a trimmer that won’t break the bank? This is the one for you. It comes in at a fairly low price, but it still provides a surprising amount of power to make sure that the job gets done. The 20V battery might not be the best for old wood, but when it comes to leaves and twigs it’ll take care of it. It’s usable up to 6 ½’ and you’ll find it can make short work of any branch less than 7/16” in diameter. It’s not the flashiest or the most powerful, but it’s cheap and it’ll get the job done. While it might seem pretty easy to just grab one and go for it, you might want to think things through a little bit before you decide to make a purchase. Keep the following in mind when you’re looking for the right pole hedge trimmer for you and you’ll end up with one that’s just right for your needs. Like their smaller relatives, pole hedge trimmers come in three varieties. Each has it’s own advantages. Gas powered trimmers are the beefiest. By far, you’ll find that they have the highest horsepower, and they can rip through just about anything with an amazing amount of ease. They also tend to be heavier, and you’ll have to keep them topped up and the small internal combustion engine powering them will require regular maintenance. You’ll mostly see these being used by professional landscapers. Pole hedge trimmers are already a bit heavy and the extra weight of the motor isn’t a good trade-off for the power if you’re just working around your home. Battery operated trimmers are the most convenient but lowest powered. They’re mostly useful if you’re not having to hit thicker, woodier shrubs and hedges. For the average front yard they’re definitely powerful enough, and the pole will let you manage the tops of most shrubbery pretty easily. What they lack in power, they make up for in convenience. Since you won’t need to fill them with gas or run a cord to them they’re ideal for light to moderate usage around the home. They do weigh a little bit more than cord-run trimmers, but all you’ll need to do is carry it around with you in the yard in order to get the work done. Electrical trimmers offer the best trade-off between power and convenience, with a catch. Since you’ll have to run a cord with an electrical trimmer, they can be a pain to use in yards with a lot of twists and turns and plants that can catch the electrical cord. Keep that in mind before you decide to go with one. They tend to be the lightest, however, and if your yard is open enough they’re convenient to use. Most folks will find them to be great, but if you’re cutting through a jungle of a yard then you might end up spending as much time dragging the cord around as you do getting work done. Deciding on a power source is really the most important part of the whole process, and once you have that down you’re almost ready to pick out a trimmer. First, take a good look at what you’re planning on cutting. It’s alright, we’ll wait. Thick, woody shrubs can often host branches with some serious size to them. You’ll need to make sure that whichever trimmer you go with can easily handle the branches within, or you’re going to have to break out a saw when it comes time to get cutting. 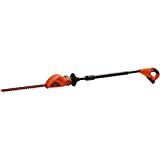 Of course, the branches will be thicker if you’re cutting for the first time in quite a while and with heavily wooded shrubs you might have to break out the saw for the first time even if you purchase a gas powered monster of a pole trimmer. Most trimmers will give you a good idea of what they can handle. Don’t try to tackle anything bigger than the range they’re rated for, in many cases you can damage the trimmer and void your warranty all at the same time if you just plow through. You’ll also want to take into account the weight of the trimmer you’re looking at. Lighter trimmers will tend to have less power, but if you’re not super fit then it can get tiring quickly to be waving around a heavy trimmer. Most, but not all, modern pole trimmers will have an adjustable head. You want one, trust us on that, since it will allow you to get the tops of hedges cleaned up without having to resort to the dreaded ladder. And finally, you’ll need to take into account the cost of the trimmer. Like most items, an expensive trimmer is generally the better choice, but in this instance it’s not wise to buy only based on cost, either high or low. Whatever you do, make sure the pole hedge trimmer that you acquire is right for you. Keep in mind the above, and you pretty much can’t go wrong. 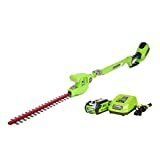 How Do I Use a Pole Hedge Trimmer? Operating a pole hedge trimmer isn’t particularly difficult, however like any power tool, you need to pay close attention, and take all of the proper safety precautions. How you use the trimmer will depend on what kind of work you are using it for. If you’re looking to have your hedges take a certain shape, it’s important that you start trimming them to that shape soon after you have them planted. Once planted and growing, you can use your trimmer to maintain the shape. Always check that your hedges and bushes are free from birds and other animals that could be disturbed by your hedge trimming. Adjust your pole trimmer to the correct height, and you should be ready to use it to trim your hedges and bushes the way you want them. If you need the extra reach, a pole hedge trimmer is what you need. Pick up one of these models and stop straining to get to those high spots!